Say goodbye to the mountains; macOS is going to the desert. It wouldn't be WWDC if Apple didn't give an update on the future of macOS, the company's oldest computing platform. Senior VP of software engineering and Unofficial Apple Dad Craig Federighi is on stage walking the crowd through the updates. But first, we had to get through the naming scheme -- Federighi says that they've been on a "mountain bender" for four years now, so this year's update will change things up. It's called macOS Mojave. 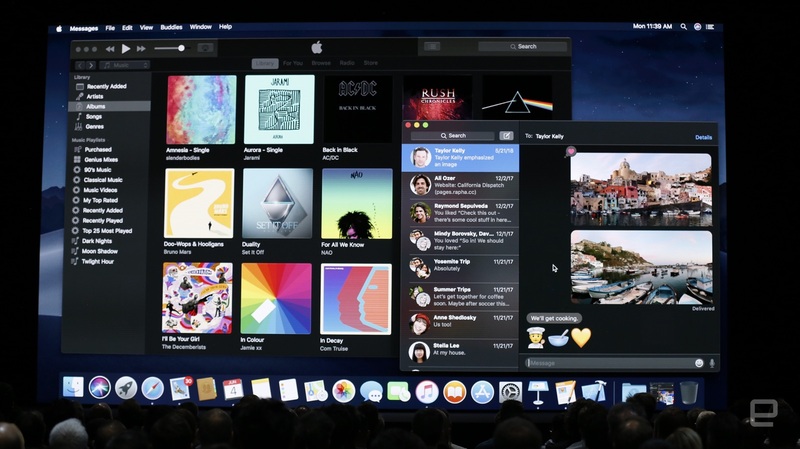 The first feature on display was inspired by the desert: a "night mode" on the Mac for the first time. Federighi says it's not just a personal preference; it was designed with professionals in mind. In particular, it looks good for presentations and photography, but will be applied to basically all of the Mac's first-party apps; we wager third-party apps will need to be updated though. The second new feature is called "dynamic desktop" -- and this appears to be just a cosmetic change, as the wallpaper circles through the time of day as the hours tick by. It's definitely cool. Moving on to more useful features, a new organization scheme for the desktop called "stacks" will help clean up a desktop that might be overloaded with documents. It can organize files by file types like documents, presentations, spreadsheets, PDFs, images and so on. Clicking a stack expands it so you can see all the files in it. There's also a new view mode in the Finder called gallery mode. It shows a large preview of the file you're looking at (the demo showed off photos), and there's a strip along the bottom that lets you scrub through your files. Finally, there's a new right-side data area that shows all of the metadata for a file -- another feature that'll definitely be useful for photographers. Sticking with the Finder, there's a new mark-up mode built into the Quick Look preview mode. If you open a PDF in quick look, for example, you can open the markup tools to add a signature, or you can rotate a photograph without having to actually open the file. Screenshots are getting an upgrade, as well. After grabbing an area, it shows up in the bottom right corner, similar to how screenshots show up in the bottom left corner on iOS. Clicking that preview brings up mark-up tools that are similar to what we saw in the Quick Look section. There's also a new screenshot tools area for when you want to grab something, and perhaps the coolest thing about those is a video screenshot tool. If there's an animation playing on a webpage, for example, you can capture that easily and get the details of the animation instead of a static image. Federighi also discussed Continuity, the ties between iOS and Mac. The first one he discussed was called "Continuity Camera." There's an option in the Mac right-click area that says "take photo" -- once you take it, it shoots it right back to the Mac. Basically, it's a wireless remote capture tool for your iPhone. There's also a document-scanning option that works the same way. Some of Apple's native apps got a few updates, just like they did on iOS. Apple News will come to the Mac for the first time, with the new iPad layout we saw earlier. Stocks and Voice Memos, both of which also are coming to the iPad for the first time, will be on the Mac as well. The Home app, which controls your smartphone devices, is launching for the Mac for the first time. Federighi didn't mention Apple Books, but we have to presume that'll be making its way to this software update as well. Moving on, Federighi discussed privacy, obviously a hot topic right now. Mojave will start alerting you when apps want access to your camera and microphone as well as lots of personal data like your mail database or messages history. New security features are coming to the Safari browser, as well. This year, Apple is focusing on things like the "like and share" buttons you see all over the web as well as the "commenting" areas that use Facebook. If you want to access these comments, the Mac will ask you for access. macOS Mojave is also making it harder for sites to build a "fingerprint" of your device's hardware -- it'll present how you're viewing a website to that site as a very basic, simplified version of what you see. That means that "your Mac will look more like other Macs" and less like your particular machine. The Mac App Store is also getting a redesign, following the big redesign that came to iOS 11. Unsurprisingly, it looks a lot like the iOS redesign, with big app "stories" to help users dig more into what an app does before you download it. There are also tabs with categories of apps like create, work, play and develop. It's a bit of a high-level navigation scheme for what you want to do before you jump into deeper, more granular categories. And in a little bit of a surprise, Apple noted that Microsoft is bringing Office 365 to the Mac App Store for the first time. Adobe is also bringing Lightroom CC to the store, another first. Prior to WWDC, there wasn't a lot of rumors or conjecture about what Apple had in store for the Mac this year, in keeping with the slightly more chill vibe that we've gotten from this event after last year's hardware-packed bonanza. Most of the chatter focused on macOS and iOS converging even more -- late last year, there was a rumor that Apple would even let iPad apps run on the Mac for the first time. But that wild OS mash-up will have to be saved for a future date.